APA style is a set of guidelines for writing in psychology and related fields. These guidelines are set down in the Publication Manual of the American Psychological Association (APA, 2006). The Publication Manual originated in 1929 as a short journal article that provided basic standards for preparing manuscripts to be submitted for publication (Bentley et al. 1929). It was later expanded and published as a book by the association and is now in its sixth edition. The primary purpose of APA style is to facilitate scientific communication by promoting clarity of expression and by standardizing the organization and content of research articles and book chapters. It is easier to write about research when you know what information to present, the order in which to present it, and even the style in which to present it. Likewise, it is easier to read about research when it is presented in familiar and expected ways. APA style is best thought of as a “genre” of writing that is appropriate for presenting the results of psychological research—especially in academic and professional contexts. It is not synonymous with “good writing” in general. You would not write a literary analysis for an English class, even if it were based on psychoanalytic concepts, in APA style. You would write it in Modern Language Association (MLA) style instead. And you would not write a newspaper article, even if it were about a new breakthrough in behavioral neuroscience, in APA style. You would write it in Associated Press (AP) style instead. At the same time, you would not write an empirical research report in MLA style, in AP style, or in the style of a romance novel, an e-mail to a friend, or a shopping list. You would write it in APA style. 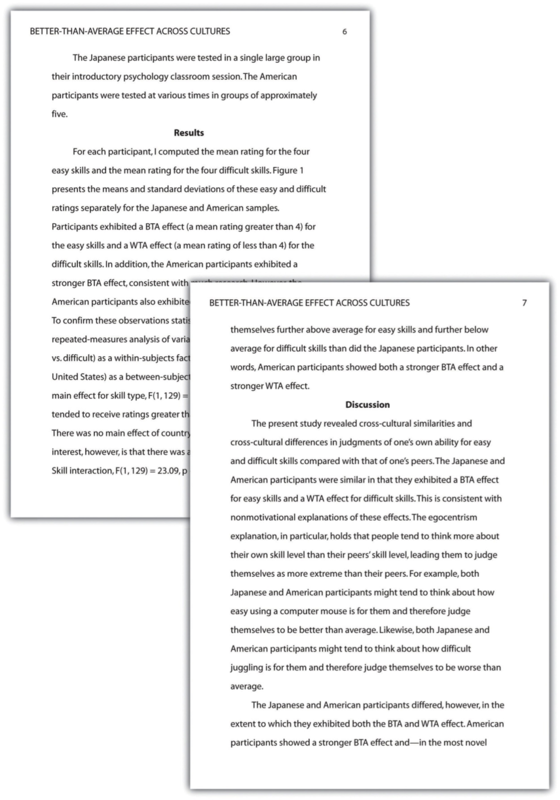 Part of being a good writer in general is adopting a style that is appropriate to the writing task at hand, and for writing about psychological research, this is APA style. The second level of APA style can be referred to as high-level style (covered in Chapter 3 “Writing Clearly and Concisely” of the Publication Manual), which includes guidelines for the clear expression of ideas. There are two important themes here. One is that APA-style writing is formal rather than informal. It adopts a tone that is appropriate for communicating with professional colleagues—other researchers and practitioners—who share an interest in the topic. Beyond this shared interest, however, these colleagues are not necessarily similar to the writer or to each other. A graduate student in British Columbia might be writing an article that will be read by a young psychotherapist in Toronto and a respected professor of psychology in Tokyo. Thus formal writing avoids slang, contractions, pop culture references, humor, and other elements that would be acceptable in talking with a friend or in writing informally. Robert Madigan and his colleagues have argued that APA style has a purpose that often goes unrecognized (Madigan, Johnson, and Linton 1995). Specifically, it promotes psychologists’ scientific values and assumptions. From this perspective, many features of APA style that at first seem arbitrary actually make good sense. Following are several features of APA-style writing and the scientific values or assumptions they reflect. The general principles for avoiding biased language are fairly simple. First, be sensitive to labels by avoiding terms that are offensive or have negative connotations. This includes terms that identify people with a disorder or other problem they happen to have. For example, patients with schizophrenia is better than schizophrenics. Second, use more specific terms rather than more general ones. For example, Chinese Canadians is better than Asian Canadians if everyone in the group is, in fact, Chinese Canadian. Third, avoid objectifying research participants. Instead, acknowledge their active contribution to the research. For example, “The students completed the questionnaire” is better than “The subjects were administered the questionnaire.” Note that this principle also makes for clearer, more engaging writing. Figure 12.1 shows several more examples that follow these general principles. The third level of APA style can be referred to as low-level style (which is covered in Chapter 4 “The Mechanics of Style” through Chapter 7 “Reference Examples” of the Publication Manual.) Low-level style includes all the specific guidelines pertaining to spelling, grammar, references and reference citations, numbers and statistics, figures and tables, and so on. There are so many low-level guidelines that even experienced professionals need to consult the Publication Manual from time to time. 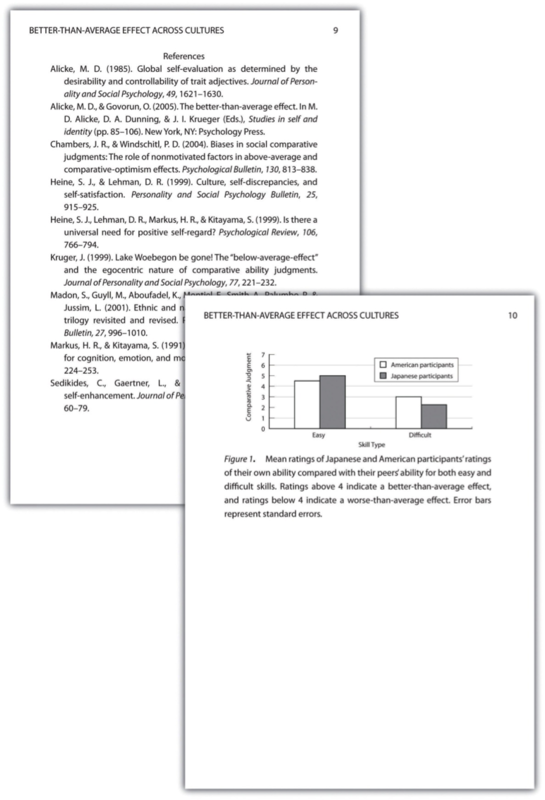 Figure 12.2 contains some of the most common types of APA style errors based on an analysis of manuscripts submitted to one professional journal over a 6-year period (Onwuegbuzie et al. 2010). These errors were committed by professional researchers but are probably similar to those that students commit the most too. See also Note 11.8 “Online APA Style Resources” in this section and, of course, the Publication Manual itself. At the end of an APA-style article or book chapter is a list that contains references to all the works cited in the text (and only the works cited in the text). The reference list begins on its own page, with the heading “References,” centered in upper and lower case. The references themselves are then listed alphabetically according to the last names of the first named author for each citation. (As in the rest of an APA-style manuscript, everything is double- spaced.) Many different kinds of works might be cited in APA-style articles and book chapters, including magazine articles, websites, government documents, and even television shows. Of course, you should consult the Publication Manual or Online APA Style Resources for details on how to format them. Here we will focus on formatting references for the three most common kinds of works cited in APA style: journal articles, books, and book chapters. When you refer to another researcher’s idea, you must include a reference citation (in the text) to the work in which that idea originally appeared and a full reference to that work in the reference list. What counts as an idea that must be cited? In general, this includes phenomena discovered by other researchers, theories they have developed, hypotheses they have derived, and specific methods they have used (e.g., specific questionnaires or stimulus materials). Citations should also appear for factual information that is not common knowledge so that other researchers can check that information for themselves. For example, in an article on the effect of cell phone usage on driving ability, the writer might cite official statistics on the number of cell phone–related accidents that occur each year. Among the ideas that do not need citations are widely shared methodological and statistical concepts (e.g., between-subjects design, t test) and statements that are so broad that they would be difficult for anyone to argue with (e.g., “Working memory plays a role in many daily activities.”). Be careful, though, because “common knowledge” about human behavior is often incorrect. Therefore, when in doubt, find an appropriate reference to cite or remove the questionable assertion. An APA-style research report begins with a title page. The title is centered in the upper half of the page, with each important word capitalized. The title should clearly and concisely (in about 12 words or fewer) communicate the primary variables and research questions. This sometimes requires a main title followed by a subtitle that elaborates on the main title, in which case the main title and subtitle are separated by a colon. Here are some titles from recent issues of professional journals published by the American Psychological Association. Virtual Driving and Risk Taking: Do Racing Games Increase Risk-Taking Cognitions, Affect, and Behavior? 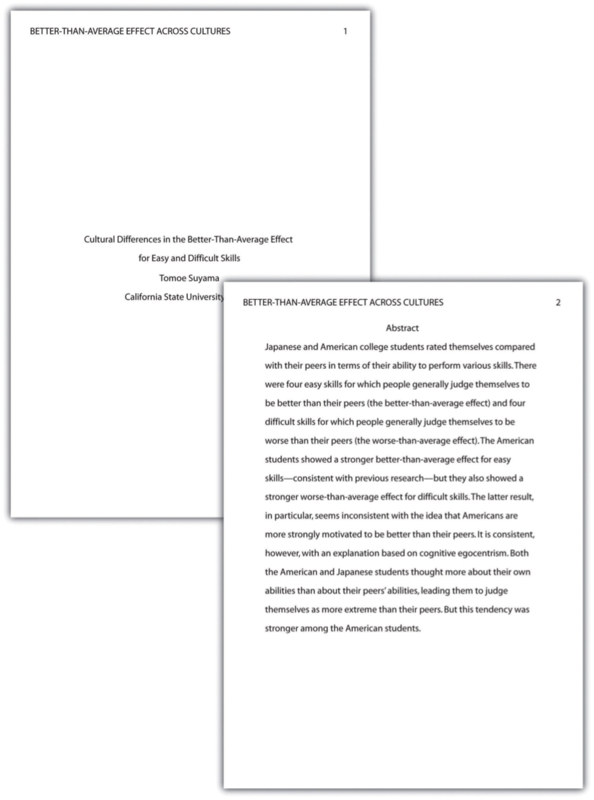 Although both humor and personal anecdotes are generally discouraged in APA-style writing, this example is a highly effective way to start because it both engages the reader and provides an excellent real- world example of the topic under study. Finally, remember that your goal is to construct an argument for why your research question is interesting and worth addressing—not necessarily why your favorite answer to it is correct. In other words, your literature review must be balanced. If you want to emphasize the generality of a phenomenon, then of course you should discuss various studies that have demonstrated it. However, if there are other studies that have failed to demonstrate it, you should discuss them too. Or if you are proposing a new theory, then of course you should discuss findings that are consistent with that theory. However, if there are other findings that are inconsistent with it, again, you should discuss them too. It is acceptable to argue that the balance of the research supports the existence of a phenomenon or is consistent with a theory (and that is usually the best that researchers in psychology can hope for), but it is not acceptable to ignore contradictory evidence. Besides, a large part of what makes a research question interesting is uncertainty about its answer. The method section begins immediately after the introduction ends with the heading “Method” (not “Methods”) centered on the page. Immediately after this is the subheading “Participants,” left justified and in italics. The participants subsection indicates how many participants there were, the number of women and men, some indication of their age, other demographics that may be relevant to the study, and how they were recruited, including any incentives given for participation. After the participants section, the structure can vary a bit. Figure 12.3 shows three common approaches. In the first, the participants section is followed by a design and procedure subsection, which describes the rest of the method. This works well for methods that are relatively simple and can be described adequately in a few paragraphs. In the second approach, the participants section is followed by separate design and procedure subsections. This works well when both the design and the procedure are relatively complicated and each requires multiple paragraphs. Although there are no standard subsections, it is still important for the results section to be logically organized. Typically it begins with certain preliminary issues. One is whether any participants or responses were excluded from the analyses and why. The rationale for excluding data should be described clearly so that other researchers can decide whether it is appropriate. A second preliminary issue is how multiple responses were combined to produce the primary variables in the analyses. For example, if participants rated the attractiveness of 20 stimulus people, you might have to explain that you began by computing the mean attractiveness rating for each participant. Or if they recalled as many items as they could from study list of 20 words, did you count the number correctly recalled, compute the percentage correctly recalled, or perhaps compute the number correct minus the number incorrect? A third preliminary issue is the reliability of the measures. This is where you would present test-retest correlations, Cronbach’s \(\alpha\), or other statistics to show that the measures are consistent across time and across items. A final preliminary issue is whether the manipulation was successful. This is where you would report the results of any manipulation checks. The references section begins on a new page with the heading “References” centered at the top of the page. All references cited in the text are then listed in the format presented earlier. They are listed alphabetically by the last name of the first author. If two sources have the same first author, they are listed alphabetically by the last name of the second author. If all the authors are the same, then they are listed chronologically by the year of publication. Everything in the reference list is double-spaced both within and between references. Appendices, tables, and figures come after the references. An appendix is appropriate for supplemental material that would interrupt the flow of the research report if it were presented within any of the major sections. An appendix could be used to present lists of stimulus words, questionnaire items, detailed descriptions of special equipment or unusual statistical analyses, or references to the studies that are included in a meta-analysis. Each appendix begins on a new page. If there is only one, the heading is “Appendix,” centered at the top of the page. If there is more than one, the headings are “Appendix A,” “Appendix B,” and so on, and they appear in the order they were first mentioned in the text of the report. 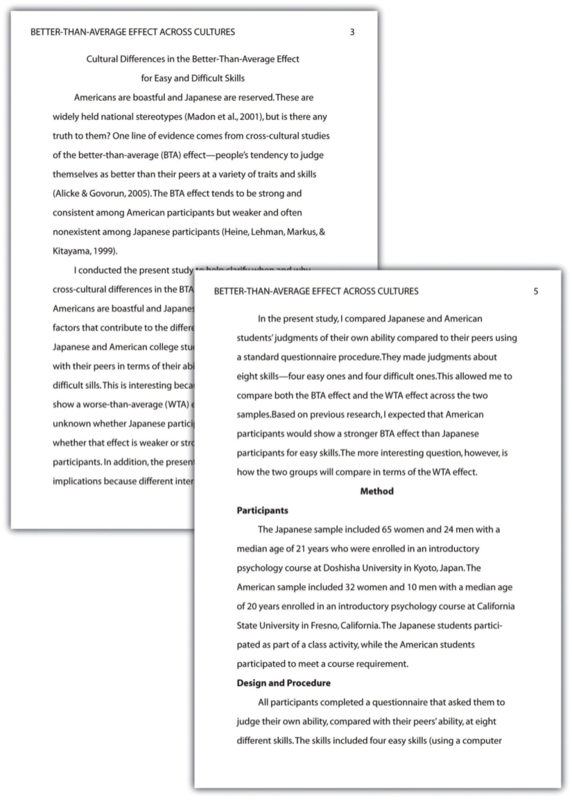 Figures 12.4, 12.5, 12.6, and 12.7 show some sample pages from an APA-style empirical research report originally written by undergraduate student Tomoe Suyama at California State University, Fresno. The main purpose of these figures is to illustrate the basic organization and formatting of an APA-style empirical research report, although many high-level and low-level style conventions can be seen here too. Figure 12.4: Title Page and Abstract. This student paper does not include the author note on the title page. The abstract appears on its own page. Figure 12.5: Introduction and Method. Note that the introduction is headed with the full title, and the method section begins immediately after the introduction ends. Figure 12.6: Results and Discussion The discussion begins immediately after the results section ends. Figure 12.7: References and Figure. If there were appendices or tables, they would come before the figure. Figure 12.8: References and Figure. If there were appendices or tables, they would come before the figure. Practice: Find a recent article in a professional journal and highlight in a different color each of the following elements in the discussion: summary, theoretical implications, practical implications, limitations, and suggestions for future research. Until now, we have focused on the formatting of manuscripts that will be submitted to a professional journal for publication. These are referred to as copy manuscripts. Many features of a copy manuscript—consistent double- spacing, the running head, and the placement of tables and figures at the end—are intended to make it easier to edit and typeset on its way to publication. The published journal article looks quite different from the copy manuscript. For example, the title and author information, the abstract, and the beginning of the introduction generally appear on the same page rather than on separate pages. In contrast, other types of manuscripts are prepared by the author in their final form with no intention of submitting them for publication elsewhere. These are called final manuscripts and include dissertations, theses, and other student papers. Although a poster can consist of several sheets of paper that are attached separately to the bulletin board, it is now more common for them to consist of a single large sheet of paper. Either way, the information is organized into distinct sections, including a title, author names and affiliations, an introduction, a method section, a results section, a discussion or conclusions section, references, and acknowledgments. Although posters can include an abstract, this may not be necessary because the poster itself is already a brief summary of the research. 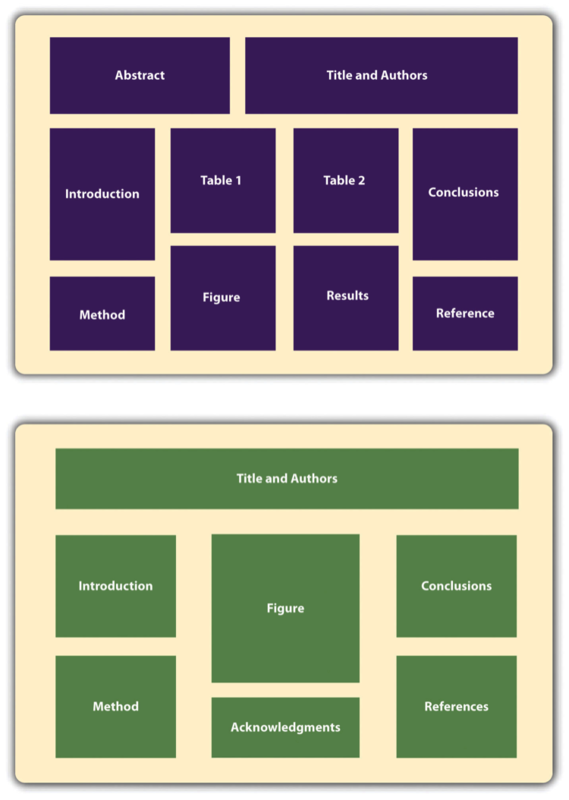 Figure 12.9 shows two different ways that the information on a poster might be organized. Given the conditions under which posters are often presented—for example, in crowded ballrooms where people are also eating, drinking, and socializing—they should be constructed so that they present the main ideas behind the research in as simple and clear a way as possible. The font sizes on a poster should be large—perhaps 72 points for the title and authors’ names and 28 points for the main text. The information should be organized into sections with clear headings, and text should be blocked into sentences or bulleted points rather than paragraphs. It is also better for it to be organized in columns and flow from top to bottom rather than to be organized in rows that flow across the poster. This makes it easier for multiple people to read at the same time without bumping into each other. Posters often include elements that add visual interest. Figures can be more colorful than those in an APA-style manuscript. Posters can also include copies of visual stimuli, photographs of the apparatus, or a simulation of participants being tested. They can also include purely decorative elements, although it is best not to overdo these. Bentley, Madison, C. A. Peerenboom, F. W. Hodge, Edward B. Passano, H. C. Warren, and M. F. Washburn. 1929. “Instructions in Regard to Preparation of Manuscript.” Psychological Bulletin 26 (2): 57. Madigan, Robert, Susan Johnson, and Patricia Linton. 1995. “The Language of Psychology: APA Style as Epistemology.” American Psychologist 50 (6): 428.